We left our little campsite on Thursday morning, a few delays whilst we worked out with the young receptionist how to explain we wanted to pay and leave, the sight of my debit card eventually did the trick. First stop was walk along to the dam at the Michelbach Barrage, built in 1979 on the edge of the village it is classed as one of the most important conservation lakes in the region. 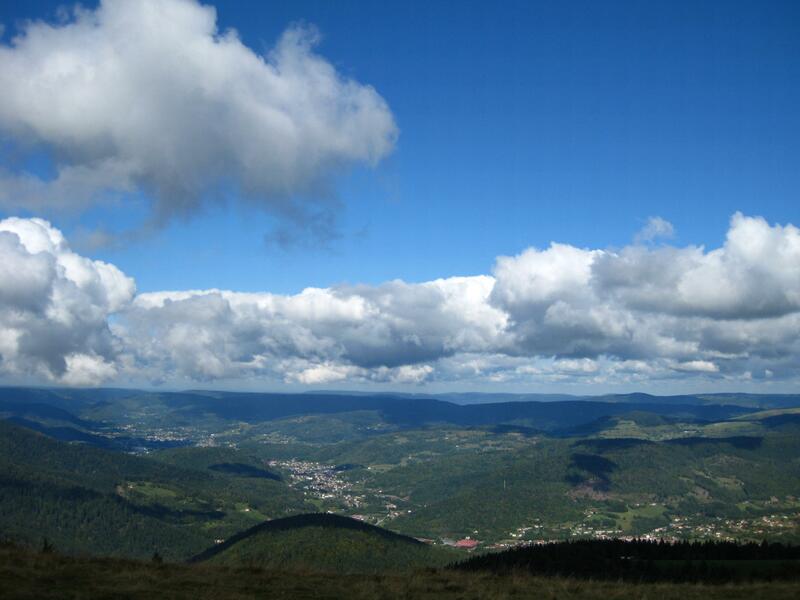 The Vosges mountains dominate the area, not being too much for climbing we avoided hiking up the highest, the Grand Ballon, and instead took the mountain road pass to the Col du Ballon. At the top of the pass there are several car parks, we parked up and walked the last bit to the peak at 3842 ft. Despite some clouds it was worth the effort, views for miles and miles. It doesn’t feel at all like being on a mountain, plenty of people drive up for lunch in the restaurants or just for a walk around. In 1905 the road was the first official mountain climb on the Tour De France, although the race had run two years previously they discounted the slightly lower nearby – by 65 ft – passes as not been true mountain climbs. There are loads of different monuments strewn around the summit, statues of the Virgin Mary, memorials to the wars, Tour De France plaques, Joan of Arc in various guises and on it goes. 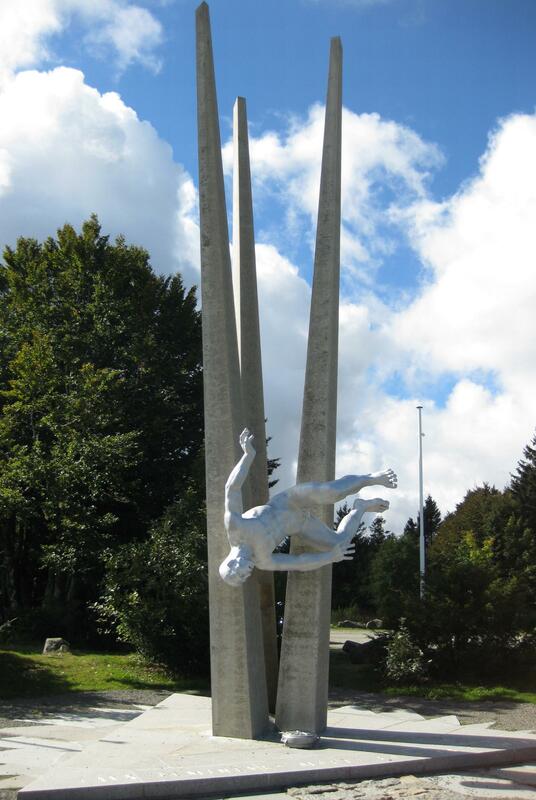 The one that grabbed our attention most was that of the ‘Hurt Locker’ which commemorates the sacrifice of 500 French plus hundreds of Italians, poles and Germans who died or were maimed detecting the thousands of mines placed on the mountain by the Germans in WWII. Plenty of ski resorts and ski areas in the Vosges, the majority seems to cater to more to day skiers as there aren’t too many hotels but the car parks are massive. 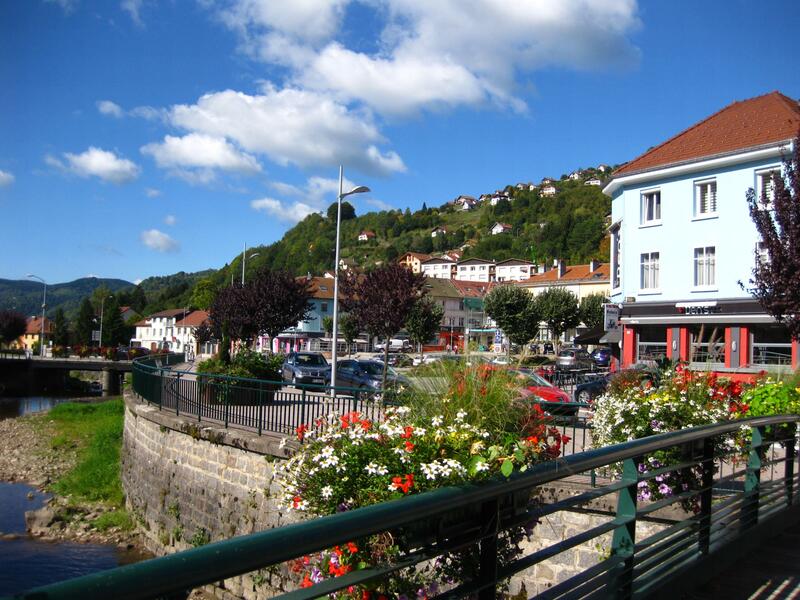 We stopped off for a night at La Bresse, a small village seemingly based around the winter tourist. 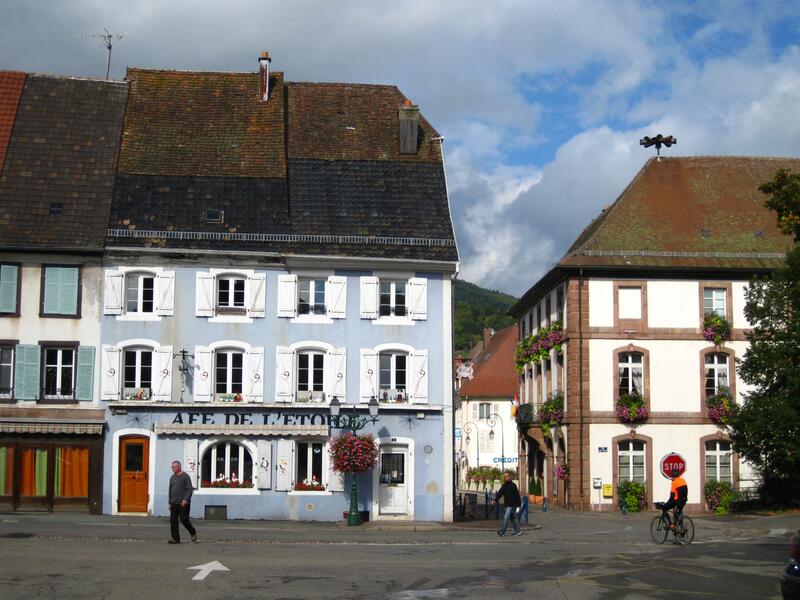 We found a small campsite a few miles out of town and in the morning walked back in to town for a browse around the shops – after just over an hours walk we were in town for 1150am – which is wonderful as the French shops shut from 12-2pm for lunch! We made do with a quick coffee and trudged back up the hill for an hour and a half (it’s slower going uphill) to the van again. As shopping was out we packed the van up and went in search of something else to do. At the top of the Col De La Schlucht, where we were thrilled to see the chair lifts running, not only that but the summer luge run from the top of the chair lift was open all the way back down ( I was so not thrilled but am getting bored of being a wimp). No queues (no one else stupid enough) we were on the ski lift before I could think about it. At the top the attendant gave us a luge each, said pull the handle to slow – push to go fast and that was it! Just over 350 ft of descent, no helmets, no crash barriers and no knee pads – just a little too much of the French indifference for me but it was the luge or the ski lift down, lesser of the two evils then :(. The luge I used may need its brakes replacing as I had them jammed on pretty much the whole time. Everytime I did let the brakes off the bloody things started climbing up the walls on the corners. There were two runs and Iain and I started together, however Iain is a bit of a speed freak and took the run down as fast as he could – he was at the bottom, off the luge and taking photos by the time I got down. Needing an overnight stop we weren’t too worried where and pulled into a large aire at the edge of the first major town we came to. At least 50 motorhomes there and we couldn’t see the attraction at first, so after parking up we took a stroll around the corner and found we were in the charming medieval town of Kayserberg. 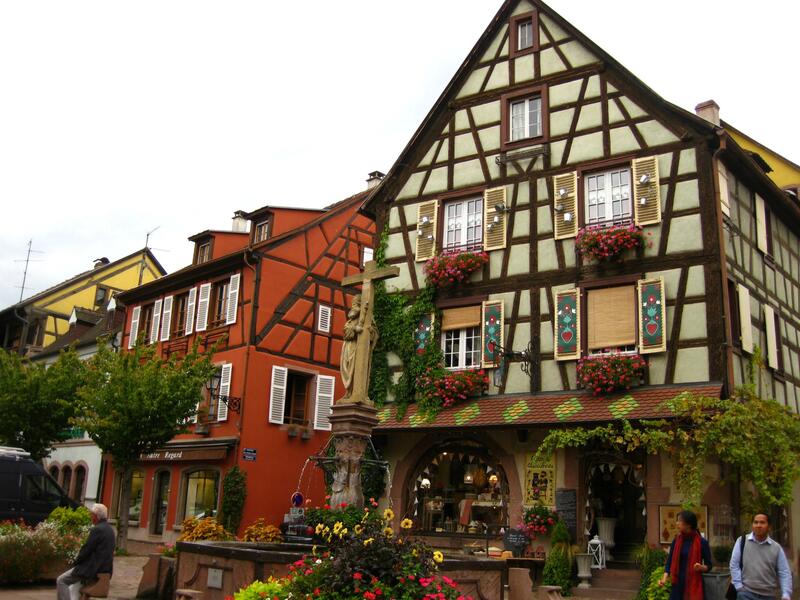 Stacked full of half timbered Renaissance houses, colourful shops, flowers everywhere – it really is like something out of a fairytale – for us how a romantic French village should look. Absolutely it is a tourist mecca but why not, the tourist thing is done well, quality shops, cafes and even an accordion player in the street (she only knew the first 4-5 lines of any song). Iain treated himself to a pastry, not cheap at €4 but everything seemed to be priced for the coach trips (it was nearly an even more expensive pastry as I threw out the carrier bag it was in thinking it was rubbish! – luckily it was wrapped and in a box within the bag so it was retrieved and saved as was my life). 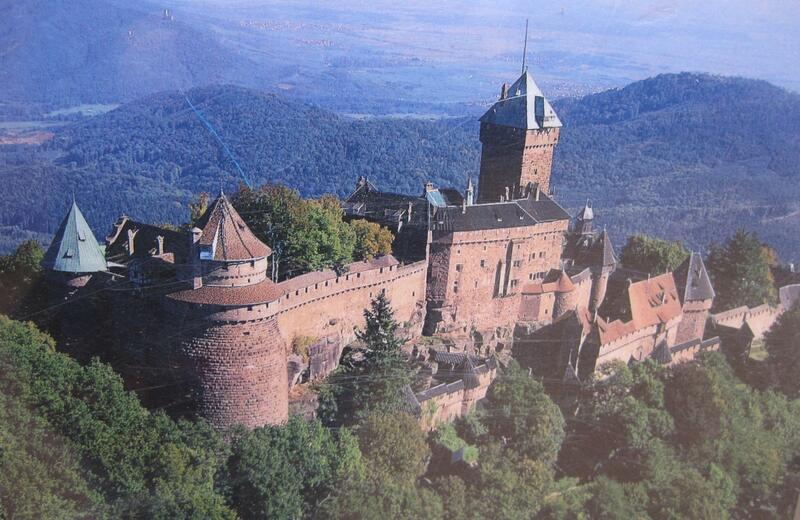 Last thing we wanted to see in the Alsace was a chateau, and the Haut-Koenisgbourg looked a good choice. Emperor Wilhelm II had it rebuilt early in the 20th century so it is fairly modern, apparently the French tend to sneer at it slightly due to its relative newness and the fact it was re-built by a German. That attitude doesn’t seem to stop the visitors though, its one of the most visited chateau in France. At the top of a high hill over 3000 ft up, the road snakes around until you are suddenly below the outer walls. One of those places you need a helicopter to take a photograph of as everything just keeps growing above you and standing back isn’t an option. Several parts were closed for renovation so we made do with a wander around the outside and the gardens – we are still living on the budget and saving entrance fees for somewhere that’s totally open. If we had a helicopter this would be ‘our’ photo…..
Only four weeks to go, so time to take stock and put a bit of a plan together. We have always said Switzerland was out as expensive and not enough time, so Sunday night we agreed to go to Interlaken! Monday morning sanity was restored and we turned right instead of left and arrived back in France. A moment of panic when we realised we were on a motorway with has tolls, we took the first exit before we reached the toll booth. As we have plenty of time we intend to keep off the toll roads and amble North on the back roads. With a mile or two we had remembered why we were so taken with France 11 months ago – quiet roads, quaint villages (still bereft of people) and as with Germany an easy life for a motorhome with specific parking and signs for ‘Camping Cars’ at every town and village. 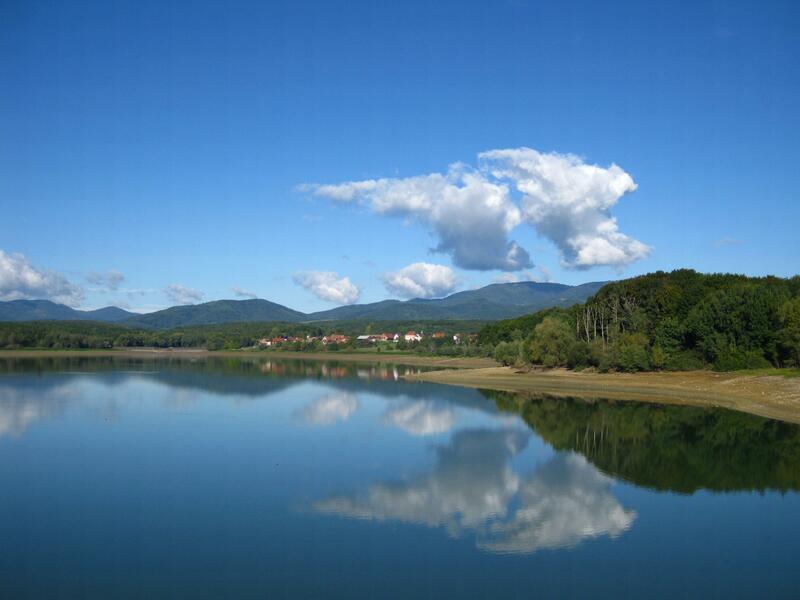 With no real plan of what to do in France we followed the road until we reached the Regional Park of Ballons des Vosges – when in doubt head for the green bits on the map seems to work well for us. From a first glance it doesn’t appear to be the most touristy of areas, that is a plus for us as we are looking for a quiet week seeing a little bit of somewhere that to be honest we had never heard of until we arrived here! First stop, Guewenheim, two chevaux village with a butchers a bakers possibly a candle stick maker but nothing much else. Strangely enough the French here speak French with a German accent, probably because they have alternated being under the control of the French and the German several times over the last couple of hundred years. We popped into the bakers and stocked up with some very good looking breads and pastries and then followed the signs to a campsite a few hundred yards out of the village. The campsite was about to close for the year, all the pitches were empty except a few seasonals still packing up. Madame La Campsite owner was more than happy to have stay and offered us a price as cheap as chips so we parked up for a few days. With the weather being a bit overcast we have set about a big clean out in the van, done a ton of washing and packed away anything we are unlikely to use in the next month. 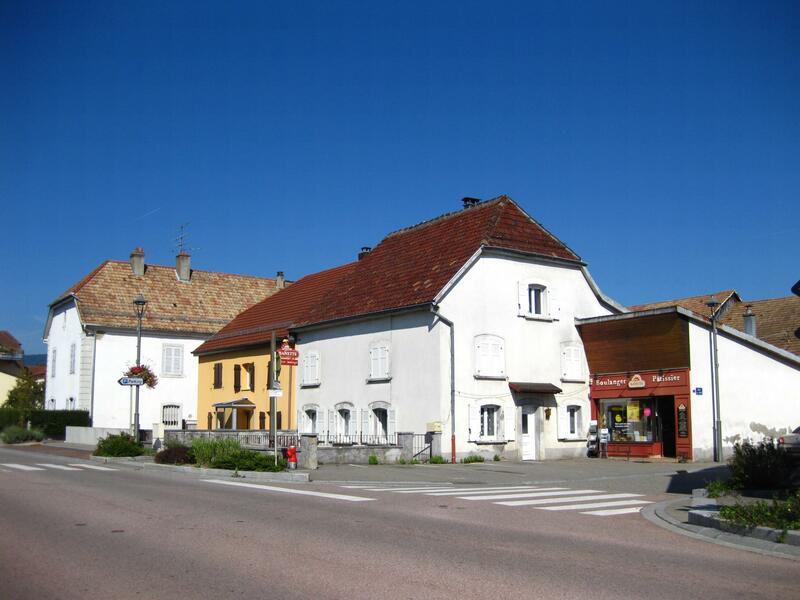 The weather improved today so we cycled up to the next village, Masevaux for a coffee and cake break. 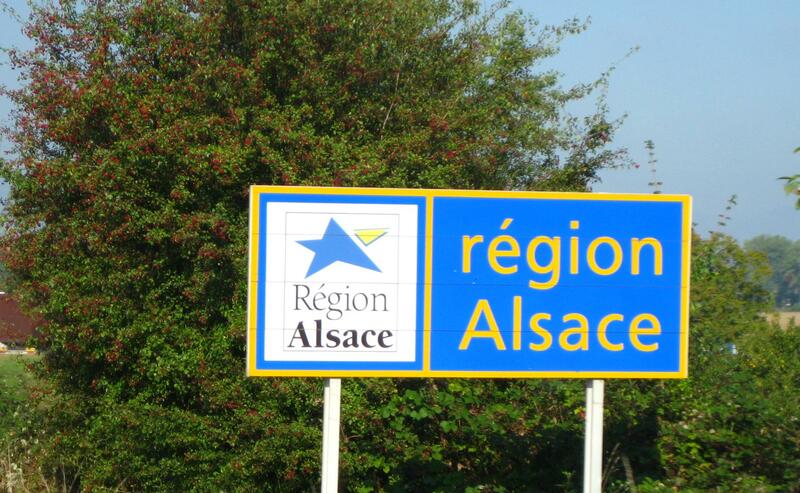 The Alsace has over 10,000 km of marked walking and cycling trails, the one we took followed the route of an old railway line, a slight incline all the way but we prefer that as we know going home is going to be easy peasy. The village was as we find with most French villages- a bit deserted to us, the shops were open but not many people around. We sat outside at a pavement cafe with our coffee, and Iain’s enormous croissant, and saw just a handful of people pass by. The French certainly take the ‘in bloom’ thing a bit seriously, the villages here are marked with stars on how well they did. Guewenheim has only two stars and a few window boxes, whereas Masevaux has four stars and some fairly amazing floral displays. the best of which was a full wooden building with flowers spilling out around wooden figurines, stunning. We want to go up to the highest peaks in the park so have been waiting out the grey weather – from tomorrow its forecast wall to wall sunshine so time to get out and explore the park and maybe find a chateau or two.